From “sleeping on the floor at the corner store to now being up in hotels on the ocean shore”, Hot new artist August Alsina from New Orleans, has the ladies going crazy! His debut album, Testimony was released last year, 15 April 2014 on his deceased brother’s birthday. 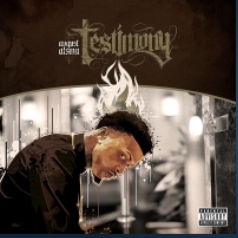 August Alsina identifies himself as “just a real n*gga coming through” by which on this album, he proves just how real he is to his anxious fans. The deluxe version of the album has 17 tracks, 4 of which are bonus tracks. Some familiar artists that are featured on his album are Jeezy, Yo Gotti, Pusha T, Rick Ross, Trinidad James, B.o.B, Fabolous, Trey Songz and Chris Brown. A well-known song on the album I luv this sh*t featuring Trinidad James, is a song many would use to identify August. This song is all about the artist just loving and embracing the perks that comes with being in the music industry. Another track that’s a favourite on the album is No Love. This track, which also has a remix featuring Nicki Minaj, is all about how he isn’t the type of guy to fall in love with. In the chorus of this song, August tries to give a female a little bit of advice or even a warning ,saying what she can expect with a guy like him, but reassuring her that he isn’t the type of guy to love saying “Don’t come looking for love”. On the track Ghetto, August also allows us to learn what kind of girl he is really into. On this track he speaks about the little things a girl does that makes him appreciate her and also that he loves that fact that she’s straight out the ghetto. Being from the ghetto can mean that she is real and she isn’t fazed by society’s crazy demands. Like most male artists, August Alsina comes across as the hard type of guy but when you listen to his album, he opens up about his life and what he went through in order to make it this far, showing a vulnerable side to him. Making all the right WAVES!